More families – and even singles – now prefer to cocoon in their homes rather than venturing out for socialization. This new trend means that the home and garden are turning into personal spaces that reflect the tastes of those who inhabit them as well as for entertaining purposes. Homes are a reflection of who we are, and what better way to show someone we appreciate him or her than to give a gift they’ll love and use. 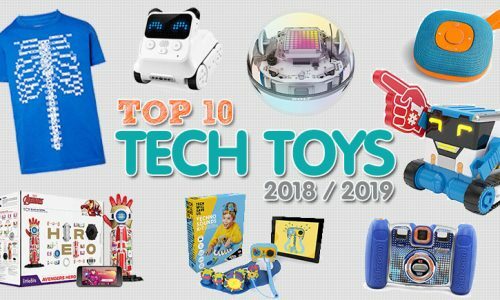 There are gifts for the kitchen, great appliances that can enhance their lives, lawn and garden décor and home enhancement items which can help improve or totally revise a space. 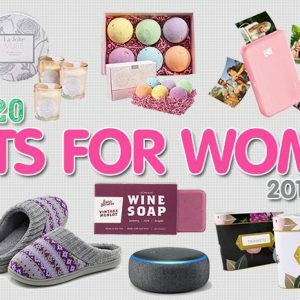 This home and garden gift guide will give you some ideas for what to choose for your homebody family and friends and make your holiday – or any day – shopping less stressful. 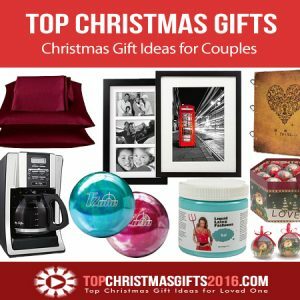 No matter what your budget constraints, you’ll be able to find gifts for the kitchen in every color, style and use you desire. From crock pots and coffee grinders to food sealing machines and frozen yogurt makers, it can all be ordered online and shipped to your doorstep. Some coffee grinders now have the ability to grind spice for your favorite recipes and you can even grind your own meat for sausage. People are creating their own food items from fresh plants and meats and you can find all sorts of classic and new items to help the trend. Many kitchen gadgets have shrunk to accommodate smaller kitchens with less storage space, but they’re new and improved to do everything the old gadgets did – and more. 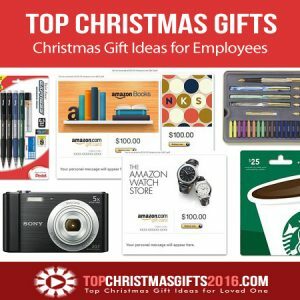 Most are designed to save time and money and make great gifts for a budding or seasoned gourmet cook. We may love to practice our cooking skills, but find less time to enjoy it. Now, there are miniature versions of the larger kitchen appliances such as the Mini-Prep Food Processor by Cuisinart. This little gadget is perfect for singles who love to cook, but have very little space and time to devote to the art. 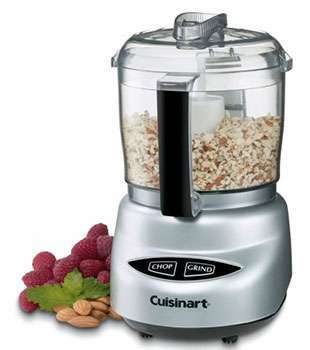 The Cuisinart Mini-Processor is a compact, 21 oz. version of the larger size and can chop and dice just as well. 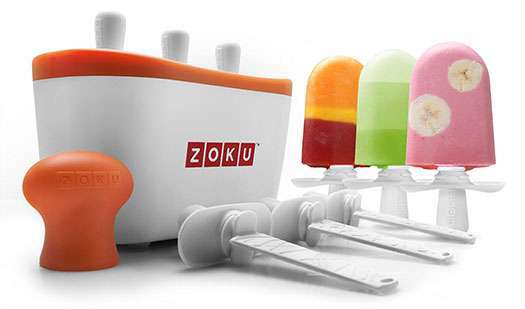 Children and grownups alike will have fun with the Zoku Quick Pop Maker from Williams-Sonoma. It only takes 7 minutes to make frozen concoctions that you can layer or center-fill with fresh fruit or your own imaginative creation. One kitchen trend that’s sure to be a best-seller this holiday season is a brainchild from Starbuck’s. 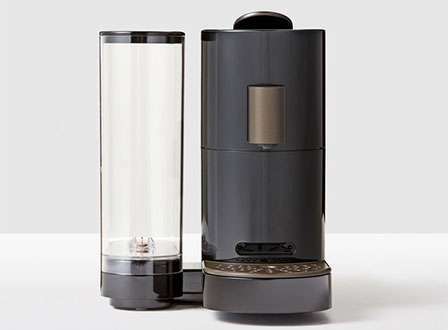 The Verismo V System lets you make your own shots of espresso, use the special froth feature to make it fancy or simply get the same quality coffee roast that you would from a Starbuck’s store. Everyone has their own kitchen personalities. Some love to cook and spend as much time as they can creating delicious meals for family and friends. Others prefer other pursuits and just want to get in and out of the kitchen as quickly as possible. Do you have a friend who’s busy all the time, but loves to put on the chef’s hat when he has a moment? Consider those appliances that will cut prep time. Choppers, dicers, blenders that puree and blend are great gifts for the busy chef in your life. A friend who just moved into a new apartment or home may enjoy the gift of updated appliances to give a whole new look to his kitchen. And they now come in all colors, so it should be easy to find something that will blend with the kitchen décor. There are all sorts of choices for the avid baker in your life. 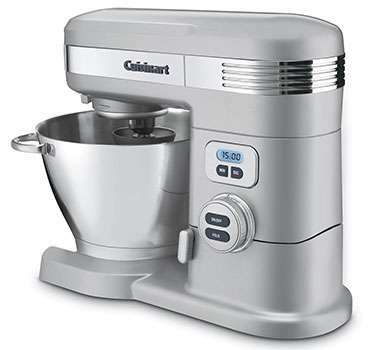 A stand mixer with attachments that can perform any task from kneading to whisking can make a baker’s dreams come true. Choose from brands such as KitchenAid and Cuisinart and that have the capacity for up to 7 quarts. Check out the Cuisinart SM-55BC, 12-Speed stand mixer in elegant brushed chrome that features a countdown timer and an automatic shutoff for precision in your timing. An immersion blender will also be appreciated by gourmet and novice chefs. 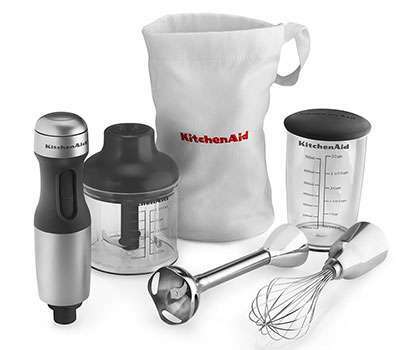 The KitchenAid KHB2351CU 3-Speed Hand Blender can help the cook create bisques, dressings or sauces and comes with various attachments that make creative cooking even easier. Other kitchen appliances that make excellent gifts include waffle makers, blenders, juicers and coffee makers. Many come with extras such as multiple settings for coffee-inspired drinks or let you choose single servings to eliminate waste. Slow cookers are making a comeback this year and you can find any size, color or variable heat and time settings that suit your needs or that make the perfect gift for a busy person in your life. There’s a kitchen gift for every personality type. 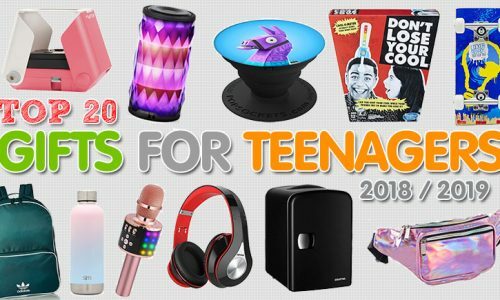 Simply surf the ‘net for ideas on gifts that will fit your budget and needs. 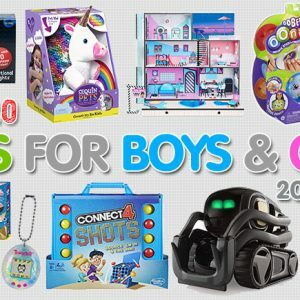 There are many deals to be found this holiday season, so have fun with your gift selection. The kitchen is said to be the heart of the home. Now, more than ever, both singles and families are flocking to the kitchen to try their skills at the culinary arts, save money and become healthier. Think of items for the kitchen as gifts for your favorite family members and friends. They’re gifts that will keep on giving throughout the year and make them think of you whenever they use them. Appliances for the home and garden can sometimes be expensive. And there are so many to choose from that it can be confusing. 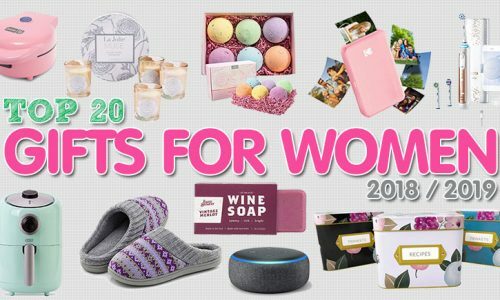 This home and garden gift guide can point you in the right direction for appliance gift-giving, no matter what your budget or needs. 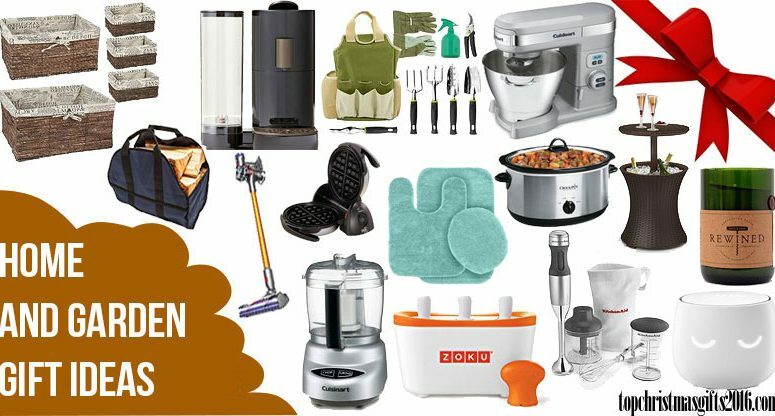 Aside from the kitchen, there are many home appliances you can get as a gift for someone you love. Think of gadgets that make life easier – such as trash compactors, warming drawer, vacuums and more. If the gift is for a spouse or parent, you might consider going with a large new appliance such as a new refrigerator, washer or dryer. 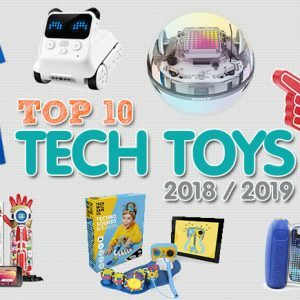 You can order online and have these items delivered right to their door in time for the holidays. There are some items that make life a bit cozier and enjoyable, such as space heaters, freestanding, small wine cellars, humidifiers and fans. If you’re thinking of getting someone an appliance, consider the space they have for the item. 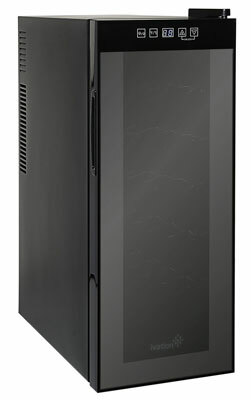 If storage space is a problem, you won’t have any trouble finding appliances that are compact and easy to store. As homes have drastically downsized, appliance manufacturers have met the challenge by producing items that are small versions of the more familiar, larger appliances. Besides downsizing, manufacturers have also made appliances lighter and less cumbersome to work with. Technology has made it possible to produce lighter versions of the old appliances your mom and grandmother used to use. Don’t let size or weight fool you – they’re still the workhorses of the kitchen with the power to do the hardest jobs, but now in a size that’s easier to handle and store. Check out the mini-appliances in various shapes, sizes and see what home tasks you can make easier. Holiday gift giving for the tranquil areas of a home that include the lawn and garden has never been more fun and easy. These areas are becoming extensions of our indoor rooms and the gift items you can choose from range from tools and plants to décor and lounging. A friend who gardens or one who heads outdoors with a cup of coffee in the morning are perfect candidates for gifts that include herb starter kits, insulated mugs, fluffy outdoor pillows or decorative items for the patio. 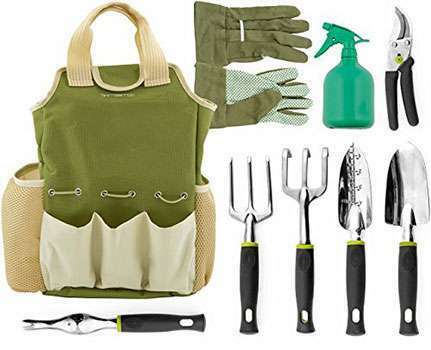 For someone who has recently developed a passion for gardening, check out the Vremi 9 Piece Garden Tools Set. It comes with 6 ergonomically designed tools, plus a tote bag to carry them in. It provides everything a beginning gardener needs. For a garden or patio area to become a tranquil place for meditation or quiet, choose from gift ideas like chimes, fountains and décor that suits the personality and taste of the person you’re gifting. 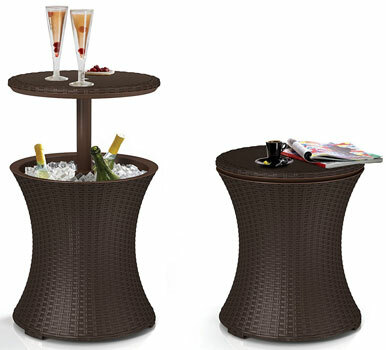 One best-selling item this year for outdoor garden enthusiasts includes the Keter Cool Bar Rattan Patio – Pool Cooler table. This clever invention is both a cooler and cocktail table. You can ice down your summer drinks and have a place to put your beverage at the same time. 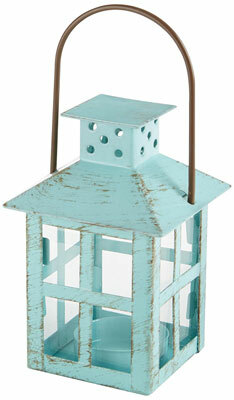 It’s the perfect barbeque and party item for the person who loves to entertain outdoors. 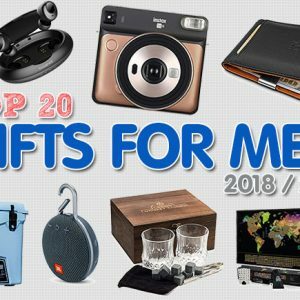 Open any home and garden magazine or surf the ‘net for a gift suitable for your outdoor-loving friends and family members. There are items for entertaining, enhancing and working within the home that will help create a dream spot for relaxing and enjoying beauty and nature. Sending a beautiful potted plant for the holidays is a good way to give a gift that keeps on giving. They can enjoy the plant indoors during the winter months and move it to the patio area when spring weather makes it a serene spot for meditating or entertaining. People with outdoor kitchens will appreciate a gift that will make their outdoor meal prep easier and give them more options for outdoor cooking. You can find appliances that withstand the erosion of weather and easy cleanup items to make life easier when entertaining. If you know a person who enjoys yard work and gardening, you’ll find a vast array of tools that will help make the work easier and even fun. Step savers such as garden carts and self-winding hoses can make the gardener’s life much easier and less stressful. Today, there are more ideas than ever before for giving home and garden gifts. Many are designed to enhance the overall look and ambiance while others are designed especially to make taking care of a home easier and less time consuming. With the soaring prices of real estate in many parts of the country, people are making wise decisions to keep the old home and enhance it with improvements they can do themselves. Not only will enhancing a home environment improve a person’s lifestyle, but it will also increase the value of a home. If you know a person who is or would like to make improvements to their living area, you’ll find many gifts to fit the bill. Depending on your budget, you could choose gift certificates from home improvement stores so they can choose what they want done. Or choose small, inexpensive gifts such as candles and decorative or storage items to add ambiance and reduce clutter in certain areas of the home. When remodeling a home, people often think of adding storage spaces to reduce clutter and make it easier to find and access items. If you have a friend who’s looking for , consider the gift of decorative baskets or bins. A basket can become part of the décor in a home – bins are great for kids’ toys, sewing items or to store rarely used items out of sight. Fill your gift with other, smaller, items for the home, add a bow and you have a great holiday or hostess gift. 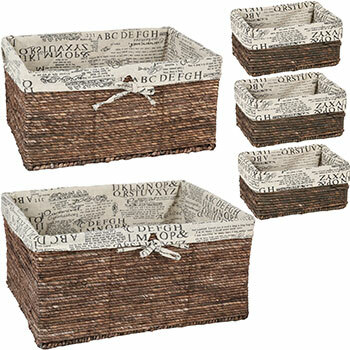 Beautifully woven, The Juvale Wicker Home Decorative Storage Organizer Baskets can be found in a 5-piece, nesting set. They feature a decorative cotton liner and are rustic and durable – perfect for storing and concealing blankets, magazines and other home items. Use these baskets anywhere in the home. Conceal them or leave them out to enhance any room’s décor. Baskets come in many shapes, sizes and colors to fit every need and desire. For the wine aficionado in your life, check out all the items available today that can both please and add a unique touch to the home. 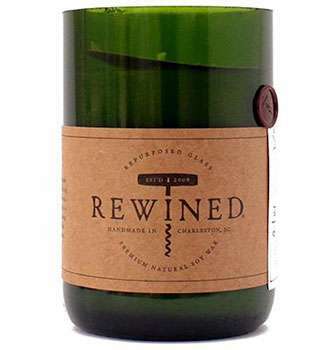 The Rewind Candles come in Chardonnay or Pinot Noir “flavors” and are not only beautiful to look at, but delicious to inhale. The Rewind Pinot Noir Candle contains, leather, cranberry, violet, fig and earth tones and the Chardonnay delights with vanilla, butter, cedar and hazelnut. They’re ensconced in glass and made with natural soy wax. From inexpensive candles to smart home items such as security systems and wireless audio devices, you can please anyone with gifts for the home that they’ll remember and use for months to come. Computer hacking is something we have to deal with and address in today’s world. 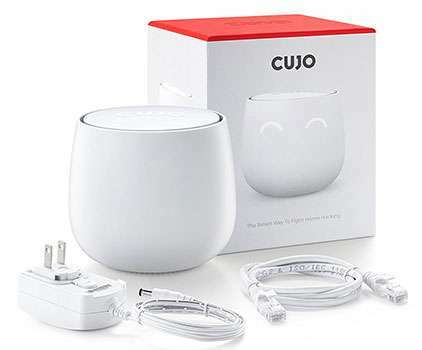 Anyone you know who uses a computer would appreciate the CUJO Smart Internet Security Firewall device which will protect the network from hacking and devastating viruses. Think outside the box when it comes to home enhancement gifts and you’ll surely please everyone on your list. 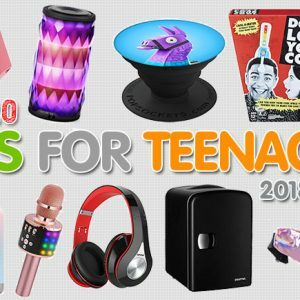 A quick search of top home and garden gift guides should give you plenty of ideas to begin. If your budget allows, consider fireplace tool sets or log carriers, tight-weave Egyptian cotton sheets, comforters or super-nice towels and rugs for the bathroom. 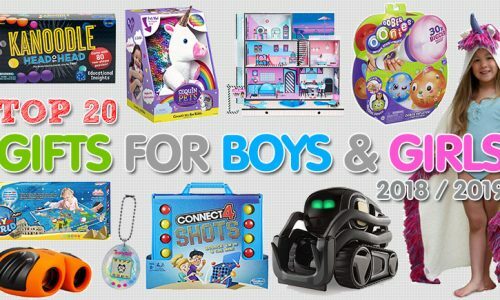 Online shopping can reveal so many ideas that will suit your gift-giving needs.